Depression can appear to be without antidote. For years I struggled with it, even though I made a good living from my paintings and to the observer, my life typified the creative dream. Horses had always been my passion and the accuracy of my portraits bore testimony to years spent in close observation drawing them in the field, but despite this they did not satisfy me. I ached to find a unique artistic expression. In search of it I had tried all manner of different approaches, mediums and subject matters but nothing really worked for me. It had to be possible for me to do better. Then I tried sculpture, but the same thing happened. Whatever I did, my work remained a pale imitation of countless other artists. I was at that time using copper wire which, braised together, resembled Leonardo da Vinci’s drawings but the work still lacked the power of authenticity. I repeatedly tended towards over finishing and the results were weak and uninspired. After months of struggle, one dark day, I sat in my studio utterly bereft of ideas. I was at my lowest ebb and close to giving up when I remembered something I had read. It was this: In any given moment the answer to your problem is staring you in the face – if only you can see it. All else had failed and I decided that I would test the theory. There was nothing to lose. If what I had read contained the truth then somewhere in this room, in this moment, lay the answer to my difficulty. Somewhere in this bleak, dirty interior littered with failed attempts and debris was something I had missed. I took a breath and sat. I looked slowly round the room, there was nothing remarkable, and nothing I had not seen a thousand times. My attention was taken by few bits of discarded twigs lying near the wood burner, the sort of thing that gardeners use to support peas. That was it. Nothing more. I had spent hours in contemplation. It was getting dark, I had grown cold, the cupboards were empty and I was hungry. Disheartened I went out to stock up on groceries. But it was as though I had been looking at a candle, the after image of the twigs and their rhythm was burned on my retina. When I returned, it was to a warm house, my son had lit the wood burner with the pea sticks. He had also chopped up a long piece of ivy that twined round a long since rotted fence post; it had been standing dusty and forgotten in a corner of my studio. Only a short section remained but to my so recently informed eye, it was a horse’s torso complete with saddle. Filled with a sudden deep excitement I picked it up and placed it into the copper wire form I had been working on. An astonishing transformation took place as the horse came alive with great force. I had never seen anything like it before. It perfectly expressed what I had been seeking and I knew with certainty that I finally held the key in my hand to a way of working that felt uniquely my own. The rest of the journey is still unfolding, thirty years on. 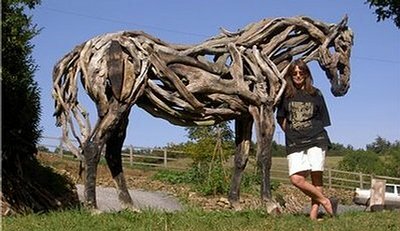 Photographs: “Apollo” by Heather Jansch – A life-size horse sculpture made from fallen Devon oakwood. Photographed at dawn in her Sculpture gardens at Olchard, Devon, UK. 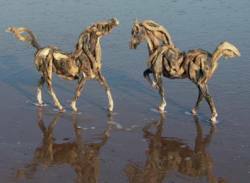 “Icarus pair” by sculptor, Heather Jansch – driftwood horses on Dawlish Beach, Devon. Heather with the big mare “Beltane Juno” – photo by Julian Hanbury. Heather’s art gallery, studios and gardens are open to visitors in May, August and September – see Events – and at other times by appointment only. 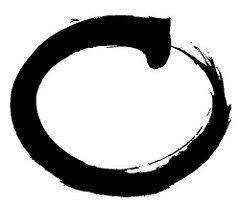 Specially written for Zen Moments by the Author. Images and words: Copyright 2009 All rights reserved. Alan and Vanessa would like to thank our great friend, Heather, for her unstinting, generous encouragement, excellent advice and unique creative input – we like to call her Zen Moments’ “Fairy Godmother”! Thanks for a wonderful inspiring story. Heathers work is fantastic. I particularly liked the “Icarus pair” they look so perfectly formed, two horses at play in the water, without a care in the world. I’d love to know the book title from which, she remembered, that a solution is always staring you in the face. Obviously it was valuable advice and a stark reminder to me, who is searching for solutions to many issues at the moment. Heather says the book (which she probably gave away) was called “Thought Force” and was published in about 1920. If we find out more we’ll post an update. Beautiful …. loved the story. My mum went to visit heathers home and came back with the Zen moments card. Ive read the story and suffering from depression and lack of inspiration myself it has shifted something in my mind. You really can see things if you just look. I have been wondering what to do as a career and what direction to go in. Ive been so low not knowing where I am at in life, But like her story the pictures of her horse sculptures made me relise what ive known all along, that i should be working with horses. Horses have given me many happy years and helped to heal through the hard times. Although i sold my horse last year I dont think I should ever give them up. So these affimations do work. Im not sure how ile put all these ideas into practice but i do feel inspired. The horses are beautiful … Heather’s story is inspirational. 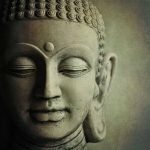 Very cool site (Zen Moments). I wandered there from Twitter somehow. Very unlike me to spend time like this doing so. Must have been a reason. Very beautiful sculpture. 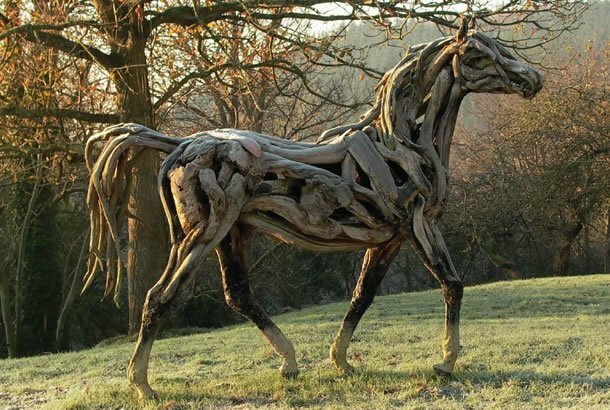 I love the power and strength conveyed by the horses and the wood makes it even more sinewy and rooted. I’m not surprised or shocked that you finally understood the language of the wood and are able to use it to make such beautiful things. I am surprised and shocked that when I went to take a closer look at one of the horses you made, it bowed it’s head and ran away. Creativity is the power that God used to make the earth and now you have a piece of that power. It is not something you found or discovered but something you always had. Congratulations! I’ve been following Heather’s work for a couple of years now. The story of her inspiration is so pure it can be nothing other can a gift. 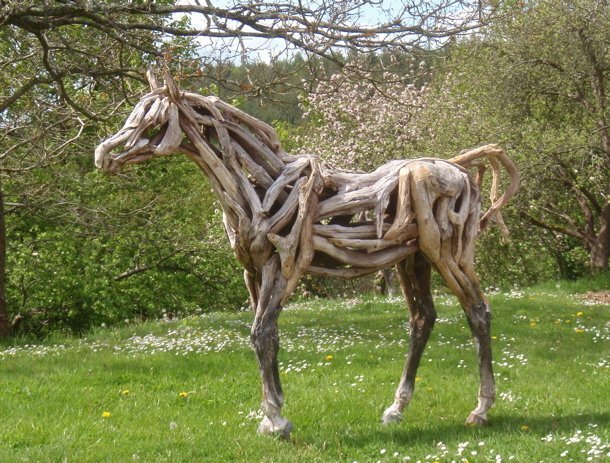 Her sculptures capture the grace and beauty that define the horse.